Drive the streets of Nairobi, and you are sure to see many matatus--colorful minibuses that transport huge numbers of people around the city. Once ramshackle affairs held together with duct tape and wire, matatus today are name-brand vehicles maxed out with aftermarket detailing. They can be stately black or extravagantly colored, sporting names, slogans, or entire tableaus, with airbrushed portraits of everyone from Kanye West to Barack Obama. 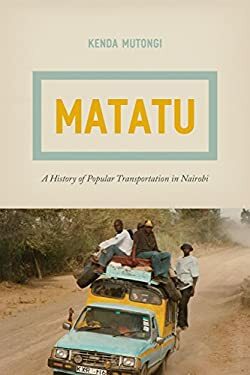 In this richly interdisciplinary book, Kenda Mutongi explores the history of the matatu from the 1960s to the present. As Mutongi shows, matatus offer a window onto the socioeconomic and political conditions of late-twentieth-century Africa. In their diversity of idiosyncratic designs, they reflect multiple and divergent aspects of Kenyan life--including, for example, rapid urbanization, organized crime, entrepreneurship, social insecurity, the transition to democracy, and popular culture--at once embodying Kenya's staggering social problems as well as the bright promises of its future. Offering a shining model of interdisciplinary analysis, Mutongi mixes historical, ethnographic, literary, linguistic, and economic approaches to tell the story of the matatu and explore the entrepreneurial aesthetics of the postcolonial world.